We finally settled in a new home last month, transitioning from a house we had rented after moving from LA back to Seattle a year ago. Last fall, the Real Estate Gods (or possibly the powers of a statue of St. Joseph, buried upside down in our California front yard – our agent Barbara’s insurance policy!) smiled on us. We sold that house after it was on the market for NINE months (!). Then, we kicked off 2011 with the hunt for a new permanent residence in or near our former neighborhood here in Seattle. Our “hunt” felt futile and endless, that is until Mother’s Day, when we made an offer on a home in Seward Park that felt like everything we could have ever dreamed of. After a day of agonizing back-and-forth, the sellers accepted our offer. So, more will be written about the beautiful garden and move-in-ready house (yeah! no renovations required! ), but for now, I need to discuss the fish pond. A sunny corner of the fish pond. 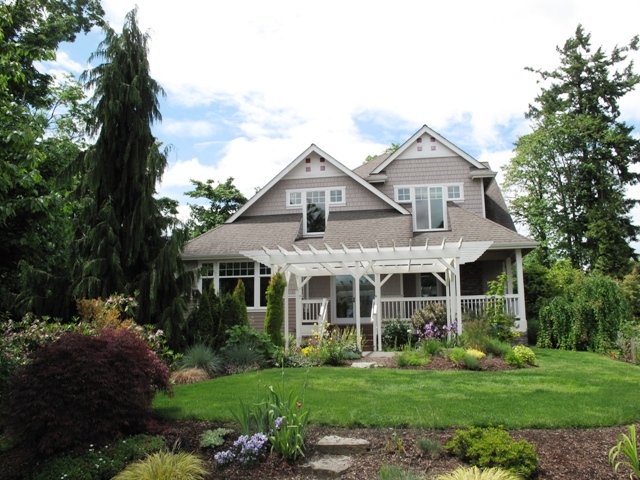 Yes, along with the amazing residence, excellent plants cared for oh-so-lovingly by the former owners, and a peek-a-boo view of Lake Washington, this property has a bonafide water garden. With lots of pretty gold, orange and white fish. 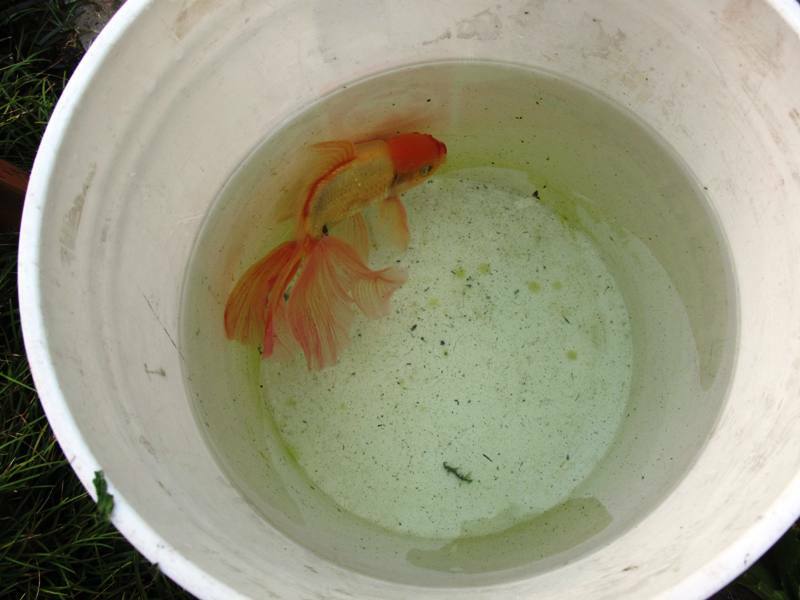 Fish that I called “Koi” for nearly a month until I was disavowed of that assumption. Well, to me, they looked like “small” koi. Guess what? 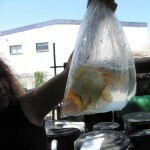 I am the proud Mama of 10 (give or take) ornamental goldfish. Inheriting a pond comes to me in an ironic way. 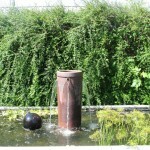 Presently, I am immersed in a writing project – to update Sunset’s Garden Pools, Fountains & Waterfalls. The book was most recently published in 2007, and is in need of refreshing with new photography and text. So as the project’s writer, I’m up to my ears in Water Gardens. But since I have never owned more than a bubbling fountain, um, well, I only know about fish ponds from a theoretical point of view. 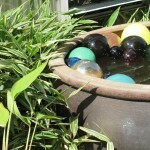 Owning a fish pond does not immediately translate into knowing how to own and care for fish. But I knew exactly where to go and who to ask for help. In 2002, I had another writing project, to update the 9th edition of an essential regional book called The Northwest Gardener’s Resource Directory. Created and nurtured for more than a decade by the amazing Stephanie Feeney, who passed away in 2000, this book is the Yellow Pages of everything Oregon, Washington & British Columbia gardening enthusiasts need to know. Oasis Water Gardens - a hidden oasis in the city! 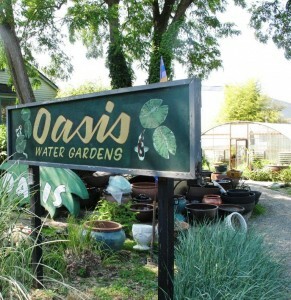 Oasis Water Gardens is an important entry in the Resource Directory. Founded by Dianne & Bob Torgerson in 1988, this nursery is indeed an OASIS in the middle of an industrial/commercial area just south of downtown Seattle. If you’re in search of water-friendly flora and fauna, here is the place to start! Red Nose in his temporary bucket-pond. “All you have to do,” Dianne coached me enthusiastically, ” is use your big net to catch your fish – and bring him into the nursery.” Our plan unfolded: The following day, I was going to bring our sick fish in a large bucket containing water from the pond to Oasis. Easy, right? I could NOT have executed this idea without my son Ben’s help. After watching me flail around for a few minutes, he said, “Mom, let me do it.” The trick was first catching Red Nose, and then gently sliding him into the bucket without tearing any of his ruffled tail fins. Stress-FULL! Fish in bucket, bucket wedged behind the passenger’s seat of my Subaru, and a verrrrrry careful drive about 5-miles away to Oasis. 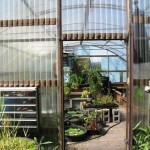 Dianne had readied a “quarantine” pond in her greenhouse for Red Nose. He will live there for a couple of weeks while receiving antibiotics. The reason he has to be isolated is that the anti-Bs are placed into the pond water – so we don’t want every fish in our pond to receive those doses. Red Nose, transferred from bucket to big plastic bag . . .
Dianne sent me home with all the stuff I need to get on top of pond ownership, including: pH test kits, ammonia test kits, nitrite test kits, bacteria additive (the good kind – for the biofilter); and a parasite treatment (she noticed that one of our brilliant orange fish had scratches on his side – indicating that he was itching himself against a rock, which is a giveaway that he has some kind of parasite). Ben also lent his muscle to helping me wrangle the huge roll of 2-inch thick mesh out of the biofilter so I could hose it off and re-install it. I only have to do that level of cleaning every 6 to 8 weeks, but I think next time I’ll wear my rainproof overalls. It is a big, wet, messy project. Yesterday, after taking the pH, ammonia and nitrite readings; after cleaning the biofilter, and after treating the pond for parasites, I unwrapped all my beautiful blown-glass floats and placed them among the waterlilies to add sparkle to the pond. What I first considered a huge hassle is going to turn into a daily dose of serenity – there’s something quite restful about watching the water flow into the pond and catching the flash of orange fish bodies dashing to and fro. This entry was posted on Sunday, July 3rd, 2011 at 9:55 am	and is filed under Creativity, Gardening, General, Landscape Design, Plants. You can follow any responses to this entry through the RSS 2.0 feed. You can leave a response, or trackback from your own site. Congratulations on your new home and your new pond and fish. I grew up with a fish pond in the back yard, but have never had the inclination to have my own. Looks like work but you are right, there is something serene about sitting beside one watching the fish swim around. POND? GREAT! GUEST ROOM? Even better. LOVE the look of the wonderful home you found. Jeff and I were JUST talking about you. Debra, that is absolutely the cutest house and garden I’ve ever seen! Good luck with Red Nose. Aren’t you a good fish mom already?! Debra Congrats on your new Garden & Home ! ….& Pond ! I’m also in the midst of a water project …. 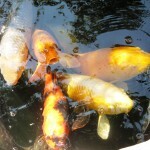 building a new pond and moving my giant Koi , gold fish & two large Red Eared Slider Turtles from my office pond to home . Still in the dirt phase of forming the shape & depth …. will be using lots of natural Malibu stones – some from Francie’s Wing Ranch ! Need material for your book revision ? 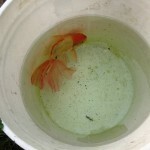 You’re right that fish ponds are a lot of upkeep and work but with the care that you’ve exhibited, I’m sure your “ornamental goldfish” will be in good hands. Hope Red Nose gets better too. What a beautiful home! And the garden looks like the perfect Seattle garden for you and your family. What a great way to start out, with your grand adventure with the goldfish. Congratulations on your new home, it looks just lovely. A pond is a wonderful feature to enhance the whole garden experience! Yes it’s work but I’m sure your family will receive many hours of pleasure relaxing by it. Thank goodness for children who help in time of need, a.k.a Ben. I love those words, “Mom, let me do it”! 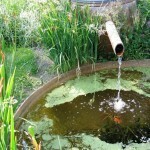 Earth mother, now water garden maven… I see wonderful things – and great stories – ahead. pH, ammonia/nitrites, and biofilters – Oh MY! Congratulations on finding just the right home! Glad to have you back in the PNW. 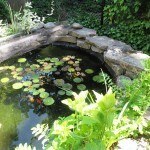 Ponds are well worth the while, natural or contrived, old or new, large or small. Unfortunately, ours drew racoons and herons like a magnet until we started using bamboo poles as a screen. Good luck to Red! I am happier for you than I can say. Once you have named your fish, you will be a full-fledged pondinista! 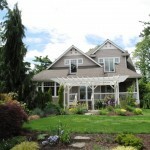 Such a beautiful home and garden – how lucky you are! Ponds are such a great source of amusement. We had one that came with our previous house. Since the previous homeowner did nothing to it, not even feeding the fish, we didn’t either (other than a yearly clean out attempting to get the water lilies back in their pots). I now have a tiny stock tank pond since I missed watching the dragonflies so much. No fish yet but I’m hoping to find a blown-glass float for it during my Seattle fling trip. Hope we get to meet then! What a perfect house, no renovations and a pond, to boot! With non-koi, even. May Red Nose make a full recovery. 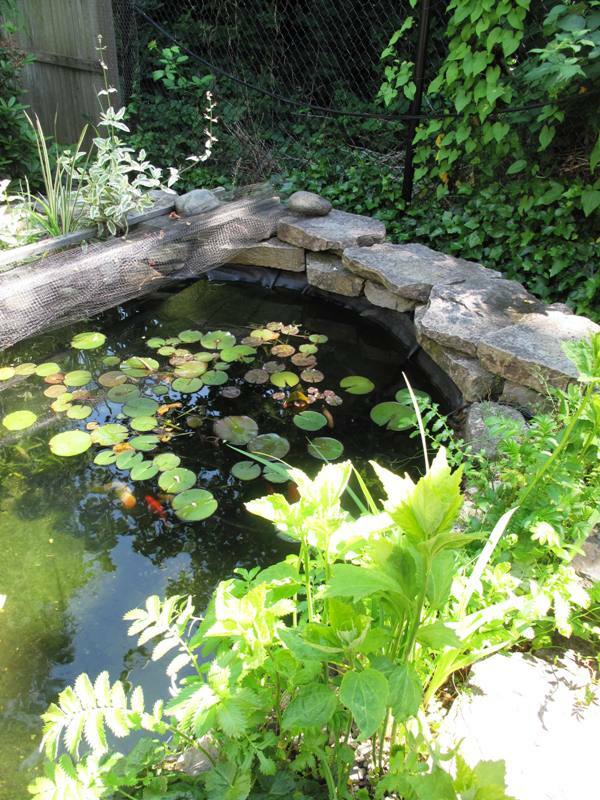 Our own pond has given us many years of delight, with several total makeovers and me falling in on more than one occasion trying to clean the pump filter. Algae covered rocks are very slippery. Messy, but worth it! Nella´s last blog post ..Was macht eine große Zahnarztpraxis? Your pond is absolutely wonderful to look at! It’s so beautiful! I could only wish to do something like this. Is Red Nose fully recovered by now? congrats! Thanks for sharing your new Seattle digs. How cool that you have a pond, and somehow not at all surprising that it is your project to be writing about water gardens. Nice, you have a great pond in your backyard, it such a lovely feature in your new home, hope I can have my own garden pond someday in my own house. Great article. A backyard just doesn’t seem complete without a pond, and I’ve devoted a considerable amount of this past weekend to setting up a pond specifically for my amphibian friends. 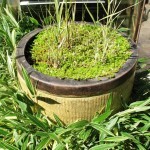 The container water gardens look great. I believe I see duckweed and some type of reed / rush plant in the photos.